Pauline Steele, or Mrs. Steele as we knew her, was my favorite teacher at Jefferson elementary school, barely edging out Mr. Trahin (third grade). Among the reasons I thought she was a great teacher: she appointed me to be the projectionist for her fifth grade class, and I gained great vocational experience threading the movie projector with the endlessly fascinating films that we watched to augment our education. Who can forget such epics as "Amazing life of a proton", "Appreciating your parents," and "The solar system." 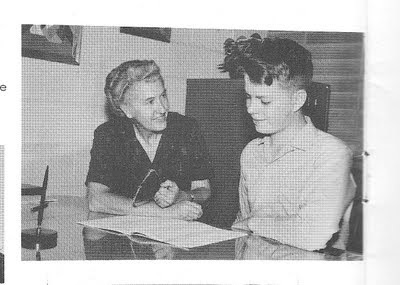 Beyond her excellent judgement in selecting students for key positions in her class, Mrs. Steele was a generous grader. My report card shows that I got E for every subject in her class for the entire year. And not only was she obviously a brilliant grader, she was a truly nice person. I liked her so much that I stayed after class several times a week to help her clean the blackboards and beat the chalk out of the erasers. The year with Mrs. Steele was very pleasant. She was a very good teacher who took a deep interest in her students. A couple of years after my cohort graduated from Jefferson elementary and moved on to junior high school, Mrs. Steele also departed, becoming the counselor at Woodland Junior High School. Aside from some chance encounters with her while I was in junior high school, I do not recall ever seeing or talking to her after I left Jefferson. However, I did run across a small book she wrote that was published locally in the late 1970s, titled "Hill Country Sayings and Ozark Folklore." Thinking back about Mrs. Steele, I thought I would rummage around the internet to see what I could find out about her. I did not find much, but what I did find rounded out my memory of her a bit. Here it is. Pauline Davis was born on July 5, 1908, the daughter of L.V. and Eliza Davis. She grew up in a big family in West Fork. The 1920 census shows that she was living there with her parents and four siblings (Lafayette C[laude], age 27; Floyd V., 21; Gregg M., 18; and Paul C., 15). According to the 1930 census, she living in Kansas City, Missouri. 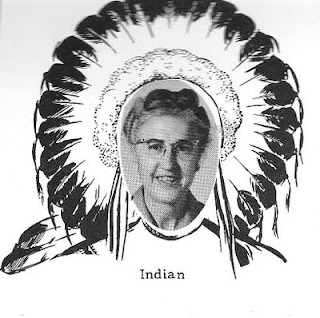 I remember thinking that Mrs. Steele had some Indian, or Native American, background. Apparently others also thought so, and may have some evidence (see picture from 1962 Woodland Roundup). However, I found nothing indicating that she had such a background. Pauline Davis became Mrs. Pauline Steele when she married a man named Cooper Steele on July 17, 1935. I could find no record of what became of him. Mrs. Steele worked for a while in the 1930s as a local telephone operate in Fayetteville, and she attended the University of Arkansas in the later years of the 1930s, earning her teaching certificate. According to a memorial web page for Mary Ruth Branham, Mrs. Steele and Mrs. Branham from 1964 to 1976 "crisscrossed the country from Virginia to California as evangelists." 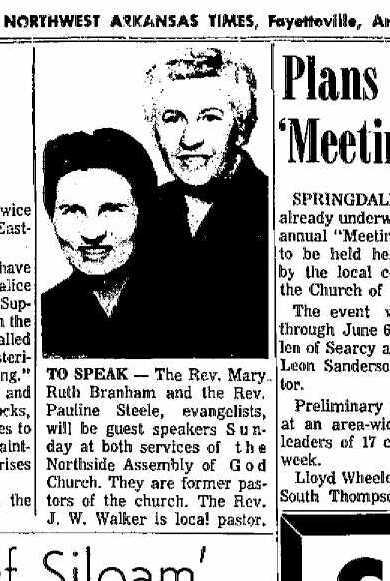 She continued her work as an evangelist and minister until her death on September 29, 1979. According to her obituary, she was at the time minister of the Evangel Assembly of God Church in Springdale. She is buried at the Baptist Ford Cemetary, south of Greenland, north of West Fork, on old Hwy 71. Enjoyed reading your blog. Grew up 2 houses down from her and Ms Branham. I remember one time as a child picking wildflowers placing in a pop bottle...knocking on the door running away as fast as I could not to be seen one may day! Thanks for sharing.